Also known as Maidenhair tree. Fan-shaped leaves turn clear yellow in fall. Grows best in well drained soil. This tree is becoming more common as a specimen plant and along streets and highways. Slow growth will not get out of bounds and interfere with power lines, etc. It has a very picturesque, wide spreading, open habit. 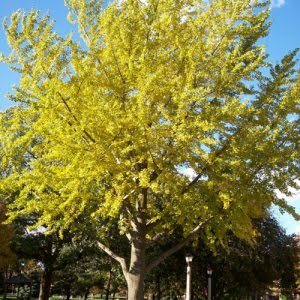 Ginkgo is not infested with any insect or disease. Ginkgo trees begin flowering and fruiting at age 30. Thank you for taking a look at our items we will be adding many more new items in the coming weeks. Picture is for example only, We currently shipping bare root Ginko 6-12"